McAfee is arguably one of the prominent names in the computer security business that provides comprehensive cyber security solutions to both consumers and organizations. Computer security has become the most pressing concern over the past few years, as new technologies keep on coming and are put to new use. A new technology is becoming a real issue for computer security, especially when it is effectively matured enough for new applications with new security problems to materialize. The Internet recently became a potential new platform for cyber criminals and hackers alike to pry around. We live in a digital age, in fact, we live in a connected world and the more connected we are, the more vulnerable we become. 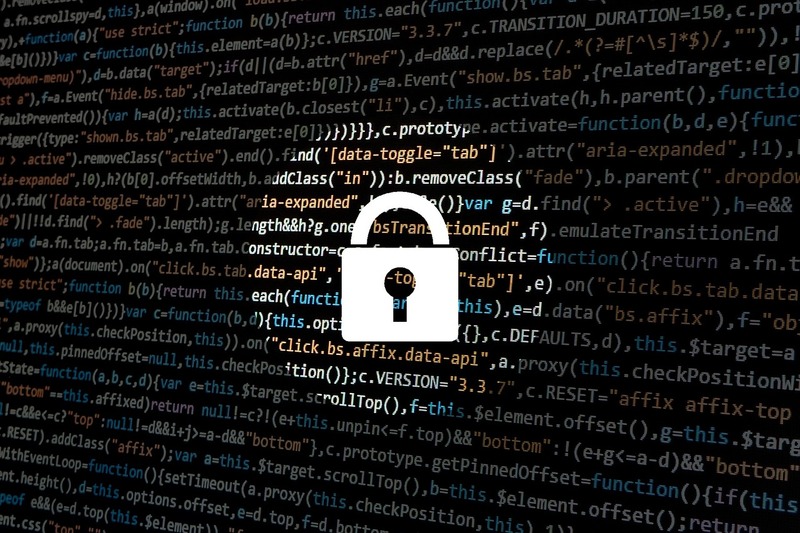 As simplified as our lives have become because of the Internet and the Web, the services offered on the web has become the main target for attacks. Today, most computers are connected to networks and most local networks are connected to the Internet, which eventually increase the probability of cyber attack on your network. This is why it’s highly recommended to run antivirus software on your system or run a firewall or other more comprehensive internet security software suites like McAfee LiveSafe and Total Protection, both of which offer plethora of security suites and utilities to serve both home and office users and large corporate clients. There is no such noticeable difference between McAfee LiveSafe and Total Protection, except Secure Cloud Storge. Let’s take a good look at both the antivirus programs. McAfee LiveSafe is one of the most popular antivirus programs in the McAfee’s sizable security portfolio that provides complete security solutions for your personal computer including virus and spyware protection. It offers total protection for all your devices including PCs, Android and iOS devices, and Mac PCs. Apart from of the basic security features such as virus and spyware protection, the antivirus program provides a ton of extra features like File Lock Encryption, Performance Optimization, Encrypted Storage, Password Manager, Free Customer Support, Parental Control and much more. It also provides a comprehensive set of anti-malware tools to keep your digital devices free from all kinds of malware. And the best part, it offers a Personal Locker that provides 1GB of secure cloud storage for all your personal stuff and confidential data. McAfee Total Protection is the McAfee’s premium antivirus program that offers everything that any typical antivirus software does and more. This is the next generation of virus removal tool that detects and eliminates all kinds of viruses and malware, both old and new. In addition, McAfee Total Protection, as the name suggests, provides real-time protection to safeguard your system from the more advanced viruses, spyware, Trojans, rootkits, and other security threats, without compromising the performance of your computer or battery life. It is an all-around security solution for all your computer security needs, plus the additional two-way firewall protection provides layer-over-layer security for advanced protection against cyber threats. – Both the antivirus programs McAfee LiveSafe and Total Protection are the two most popular and comprehensive suite of McAfee’s security solutions that provide 100% protection from all kinds of threats such as computer viruses, Trojans, spyware, spamware, malware, and more. Both provide ultimate all-around protection for multiple devices including Windows PC, Mac, Android and iOS devices. However, Total Protection is the McAfee’s premium antivirus program that offers almost everything that LiveSafe does and more, when it comes to security and protection against cyber threats. McAfee LiveSafe is more than just an antivirus software; it’s a comprehensive digital security solution for your digital space. – While there is no such big difference between the two antivirus programs in terms of security, the one thing that clearly differentiates and puts one above the other is LiveSafe’s Secure Cloud Storage. The LiveSafe offers McAfee’s Personal Locker that provides 1GB of Secure Cloud Storage that allows you to store your most precious and sensitive documents and personal stuff in the Cloud with advanced protection. The Cloud Storage uses face and voice authentication for added protection so that only you can access your secured files and no one else with unauthorized access can touch those files. It stores everything from your passport to travel documents to your personal documents. – While both the antivirus programs are fairly similar in terms of features, McAfee Total Protection offers award-winning antivirus protection and password management for multiple devices and parental control to help keep the entire family safe. The selling point of McAfee Total Protection is its award-winning antivirus scanner and web/email protection. McAfee LiveSafe, on the other hand, provides all-around security for your identity and data across all your devices, thanks to the next-gen scanning engine that offers real-time malware protection. The selling point of McAfee LiveSafe is Secure Cloud Storage that safeguards your cloud-based folders. There is no such noticeable difference between McAfee LiveSafe and Total Protection, except Secure Cloud Storge. McAfee LiveSafe offers McAfee’s Personal Locker that provides 1GB of Secure Cloud Storage that allows you to store your most precious and sensitive documents and personal stuff in the Cloud that’s safeguarded with biometric protection. McAfee Total Protection is not behind either; it protects your sensitive documents and files by encrypting them with 128-bit encryption and save them in a password-protected vault. Rest of the features is almost the same in both the antivirus programs. Sagar Khillar. "Difference Between McAfee LiveSafe and Total Protection." DifferenceBetween.net. 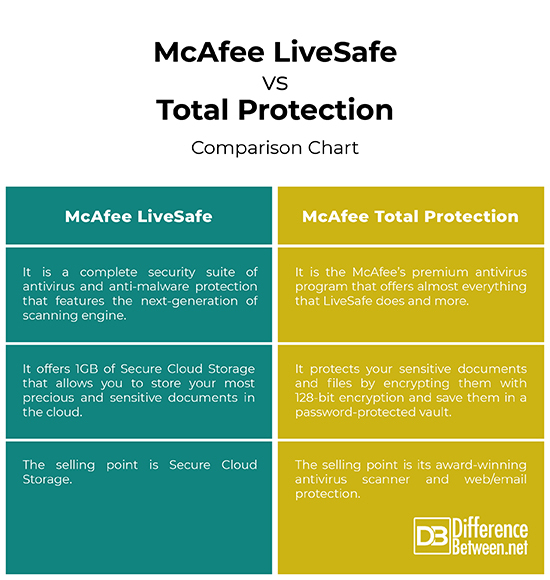 April 4, 2019 < http://www.differencebetween.net/technology/difference-between-mcafee-livesafe-and-total-protection/ >.